High unemployment. Empty office buildings. A lack of new pipelines. Falling capital investment. The challenges facing Calgary’s economy today are complex, confounding and compounding. Each problem is built upon another. It’s like watching one domino topple over onto the next. Not enough pipeline capacity leads to lower prices for Canada’s oil and gas resources. This trend contributes to reduced energy sector investment and employment. Fewer workers means companies need less office space, leaving one in four downtown office buildings vacant. More vacancies mean the city’s downtown tax base is eroding, putting pressure on the rest of Calgary businesses to fill the gap. “It is fundamentally all the same problem,” Mayor Naheed Nenshi said in an interview. 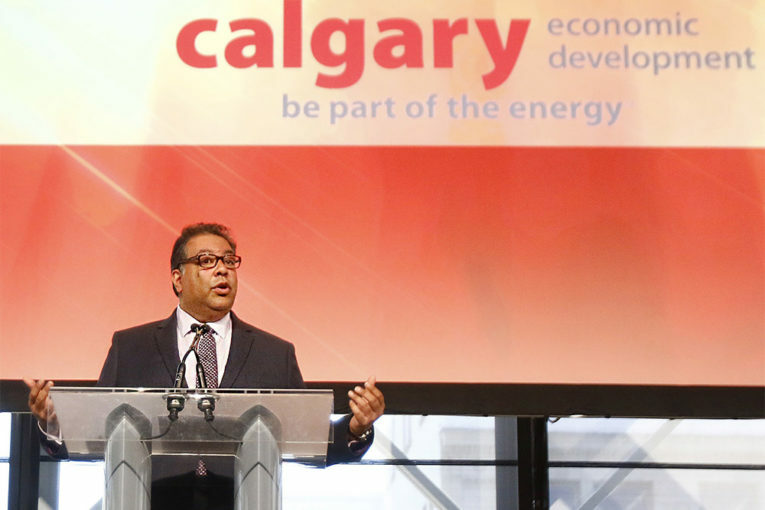 At Calgary Economic Development’s annual outlook luncheon on Wednesday, much of the talk centred on these underlying challenges and the potential fixes. The city’s development arm unveiled a new economic strategy designed to attack the causes of these issues facing Calgarians. The plan is focused on the goals of attracting talented people to the city, making Calgary the most livable and business-friendly place in the country, and turning the community into a leading location for business innovation. It’s an attempt to build on the city’s strengths, while overcoming the hurdles in the way, from the disruptive changes caused by technology to the long-term realignment of the local economy. “We know the recession is officially over in Calgary. But until we lower our unemployment or reduce the number of vacant offices downtown, it’s not a full recovery,” CED chairman Steve Allan told the crowd of almost 1,500 at the Telus Convention Centre. Steve Allan, executive chair of Calgary Economic Development. There are myriad underlying issues that must be tackled. As energy prices tanked in 2015 and ’16, investment fell and petroleum producers focused on becoming more efficient to survive and thrive. Industry capital spending fell from the dizzying heights of $81 billion in 2014 to $45 billion last year, and it’s expected to dip slightly this year. In turn, many of the construction, engineering and oilpatch jobs needed to build big-ticket projects — such as oilsands developments — dried up. Oil prices have since rebounded to close at US$76.41 a barrel on Wednesday, but there’s a daunting $41-a-barrel discount affecting Western Canadian Select heavy crude. This price differential and a lack of pipeline capacity are constraining spending. On the employment front, the situation improved throughout much of 2017, but has flattened out this summer. At 8.2 per cent, Calgary still has the second-highest unemployment rate among Canadian cities. “This recovery is starting to look like what I’d call a jobless recovery,” Nenshi said during his speech at the event. Economists believe the local unemployment situation will improve. However, construction-related jobs have declined as larger projects have wrapped up, while an influx of people moving to the city to look for work is affecting the unemployment rate. “I am not expecting it to continue. For one thing, we have more certainty on the trade front and that will help,” said ATB Financial chief economist Todd Hirsch, citing the weekend agreement between Canada and the U.S. over NAFTA. He expects Calgary’s unemployment rate will drop into the 6.5 to seven per cent range next year. “The economy is slowly picking up steam and . . . if we can get a better return for our oil price, that injects a lot of money into this province and into this economy,” added Pedro Antunes, deputy chief economist with Conference Board of Canada. 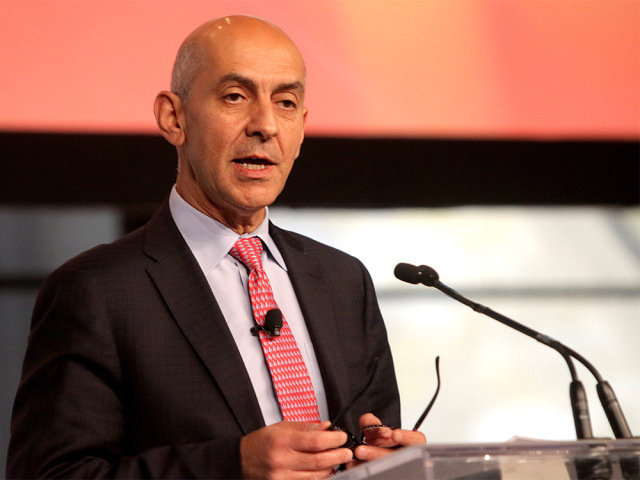 Pedro Antunes, deputy chief economist of the Conference Board of Canada. Then there’s the impact technology is having on the city, province and country. An “unprecedented wave of automation and digitization” is disrupting all aspects of business, the report points out. The new economic strategy identifies three core industries in Calgary — energy, agribusiness and transportation-logistics — along with four emerging ones: financial services, health and life sciences, creative industries and tourism. These will be the foundation for future growth. Some of the changes may sound threatening, but they also provide opportunity. The community has assets to build on, such as a young, highly educated workforce, the highest labour participation rate in the country and a great quality of life to attract newcomers. Calgary is the fourth-most livable city in the world, according to the Economist Intelligence Unit. “Cities today are really in a gunfight for talent,” said Adam Waterous, chair of the CEO task force for the report. The city is striving to diversify economically, but it has a massive edge as the headquarters of the Canadian oilpatch. The energy industry accounts for about 46,000 local jobs and it still sees billions of dollars of capital investment each year. As Nenshi noted, this week’s announcement that the $40-billion LNG Canada project will be built on the west coast is great news for British Columbia. It’s also a big deal for Calgary, because the joint venture partners have their Canadian head offices in the city. As Allan stressed, there are no quick fixes ahead. Restructuring the economy is a long-term play.